Victoria Falls is part of the Zimbabwean side of the famed waterfalls by the same name. Spend several days to admire this natural wonder, often called the largest in the world. It is a mile wide and has twice the height of Niagara. 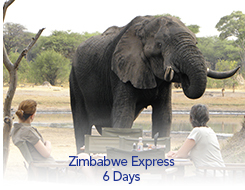 Game Drives in the Hwange National Park included. Upon arrival to Victoria Falls, you are met and transferred to your hotel. This afternoon enjoy a sundowner cruise on the Zambezi River.